Surface refinishing is the answer for homeowners in Arlington, TX, who are searching for a fast and affordable way to repair and restore their bathtubs, showers, sinks, and countertops. Miracle Method of DFW Mid-Cities is a locally owned and operated company that can repair your existing fixtures and remove any stains or discoloration in two days or less. If you’d like to see our 30 designer colors, then come to our showroom at Highway 360 and Abram. We’d love to tell you about why more than one million satisfied customers have turned to Miracle Method since 1979. Call Miracle Method of DFW Mid-Cities today to request a free estimate for your surface refinishing job in the Arlington area. 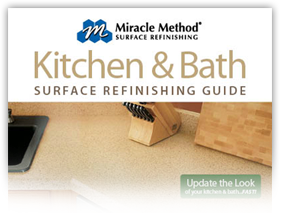 Miracle Method has been the preferred refinisher homeowners, hotels, apartments, universities and hospitals for over 30 years. We are committed to providing our customers with the best in a highly trained straff, service, knowledge, expertise and materials. Our proprietary bonding agent MM4, guarantees the the beautiful finish that was applied in your home will not peel. With proper care our surfaces should last nearly as long as the original surface. And that's what you want and deserve, isn't it? There are times when you may think the expense of remodeling is the only answer. Applying a stone finish from Miracle Method to your shower or vanity will provide the look you want for a fraction of the cost. Refinishing is less of a mess and usually takes far less time. Take your kitchen counter for example. Granite countertops have a great look but are expensive and sometimes require extensive changes to your current cupboards. Miracle Method will acheive the same look for up to 80% less in a day or two, depending on the size of your kitchen. We invite you to visit us at our showroom in Arlington at 2627 S Cooper E12 and see for yourself how beautiful your home can be. Or, we would be happy to come to your home to show you our samples and leave you with a written estimate. Either way the only cost is a kind word and a smile.